Chandra Brown was named in March as CEO of Chicago’s MxD, the manufacturing innovation hub formerly known as DMDII. With $10 million in fresh funding from the U.S. Department of Defense for 2019 and at least $20 million more pledged over the next five years, MxD is aiming to expand its work connecting industry, academia, and government to address specific, real-world challenges that manufacturers have identified. One of these is figuring out exactly what the manufacturing jobs of the future will look like so that companies can better recruit and train their future workforce. PS: You bring a variety of perspectives on where U.S. manufacturing is today and where it’s headed to your role – you were deputy assistant secretary of manufacturing in the Commerce Department under President Barack Obama, and before that you were CEO of United Streetcar and VP of Oregon Iron Works. What do you see as manufacturing’s biggest needs when it comes to workforce development, and how is MxD looking to help address those? CB: Workforce development is absolutely critical to the future competitiveness of manufacturers in the United States. We know that a strong, skilled workforce is critical for the implementation of digital technology. I think one of the common misconceptions is that digital is all about automation or Big Data. But the reality is it’s just as much about the workforce as it is about the digital side. None of it is possible without our people. Read "Manufacturing's digital future: Who's needed, and what's needed, to get from here to there"
We here (at MxD) created a jobs taxonomy – it lists roughly 165 roles and describes the roles of the future because we want to help companies. There are new jobs like “digital ethicist” that people haven’t even thought about. It’s publicly available; anyone can look at it on our website. That’s one of the ways we’re trying to help define what are these future jobs. 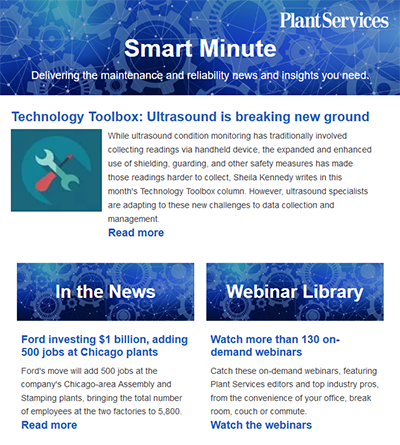 Our goal is to really help U.S. manufacturers become more competitive in the digital space. One of the things I’m most excited about in 2019 is we’re just starting to develop a digital assessment where we can go in to manufacturers and help analyze, where are you on the digital road map? A lot of companies don’t really know where they’re at, so how do you know where you want to go? PS: The companies you’ve seen and worked with that are really moving forward and seeing success with their digital initiatives – what are some keys to their success? CB: What I’ve found is in companies that are most successful, I like to think about five major lenses that we look at in terms of success. One, you have to start out with vision. Change is happening so fast, so you need leadership that has good vision and that can understand and lead through ambiguity. The second of the five is the ability to understand and lead through paradoxes, through changing times. More data requires more interpretation. The quicker you get data, the more quickly you have to change. Companies that can do that often are ahead on the digital thread. I would say the third, and this is one of the most important and what we’re about here, is collaboration. You can’t do this digital journey alone. You really need partner networks, working with your customers, your employees. You really have to have great communication and feedback loops with continuous improvement because the pace of innovation is increasing day by day and the more you can collaborate and learn from others in these emerging fields, the better off you will be. Listen to "Podcast: Why workforce development is a vital piece of the digital puzzle"
The fourth key to success is diversification. As you talk about all of this different data and information streams and creativity, you really need to foster diversity within your company, within your communications. It’s just such a dynamic and changing environment that the more diverse you are and the more you embrace that I think is a key advantage in moving forward. The fifth I would say is transformation. Digital is transformational. This is a fundamental shift in how manufacturers are going to do business. That’s why we think it’s really important to our competitive advantage here in the United States. It’s transforming, and you need the right talent for that. 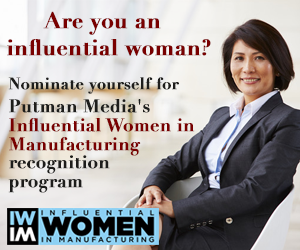 Hear from Chandra Brown on Friday, Oct. 4, at the 2019 Influential Women in Manufacturing Awards Luncheon in Chicago. For details, contact Plant Services managing editor Christine LaFave Grace at clafavegrace@putman.net.